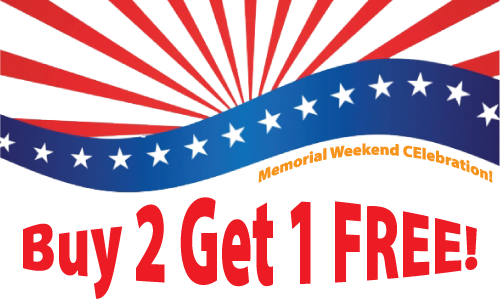 Celebrate and honor our fallen soldiers and kick-off the start of summer during our Memorial Weekend CE Sale – Buy Any 2 Courses and Get 1 FREE! Have a coupon? Apply it at checkout for even greater savings > Shop now! Add any 3 CE courses to your shopping cart and the lowest priced 3rd course will automatically deduct at checkout (courses must be purchased together, one free course per order). Offer valid on future orders only. CE Sale ends Monday, May 28, 2018. Our online courses provide instant access to the course materials (PDF download) and CE test. Successful completion of the online CE test (80% required to pass, 3 chances to take) and course evaluation are required to earn a certificate of completion. Click here to learn more. Have a question? Contact us. We’re here to help! Celebrate and honor our fallen soldiers and kick-off the start of summer during our Memorial Weekend CElebration – Buy Any 2 Courses and Get 1 FREE! Choose any 3 courses and the lowest priced 3rd course will automatically deduct at checkout (courses must be purchased together, one free course per order). Have a coupon? Apply it at checkout for additional savings! Sale ends Monday, May 25, 2015. Offer valid on future orders only. Professional Development Resources is approved to offer continuing education by the American Psychological Association (APA); the National Board of Certified Counselors (NBCC); the Association of Social Work Boards (ASWB); the American Occupational Therapy Association (AOTA); the American Speech-Language-Hearing Association (ASHA); the Commission on Dietetic Registration (CDR); theCalifornia Board of Behavioral Sciences; the Florida Boards of Social Work, Mental Health Counseling and Marriage and Family Therapy, Psychology & School Psychology, Dietetics & Nutrition, Speech-Language Pathology and Audiology, and Occupational Therapy Practice; the Ohio Counselor, Social Worker & MFT Board; the South Carolina Board of Professional Counselors & MFTs; and by the TexasBoard of Examiners of Marriage & Family Therapists and State Board of Social Worker Examiners.